Dear Santa [D6689] - $6.00 : Yarn Tree, Your wholesale source for cross stitch supplies. Cross stitch pattern by Pickle Barrel Designs. Uh ohhhh, looks like someone has been up to no good! 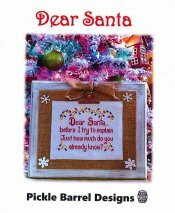 "Dear Santa...before I try to explain, just how much do you already know? ", is stitched in the middle of the design. Above & below the design, a strand of colorful Christmas lights is stitched. Who is the troublemaker in the family? Pickle Barrel has created their gift, now you just need to get to stitching it! Stitch count is 93 x 74. Stitched on #7457 Zweigart Lugana 28ct White. Opalescent/Raw Belfast Linen Short Cut 9" x 55"